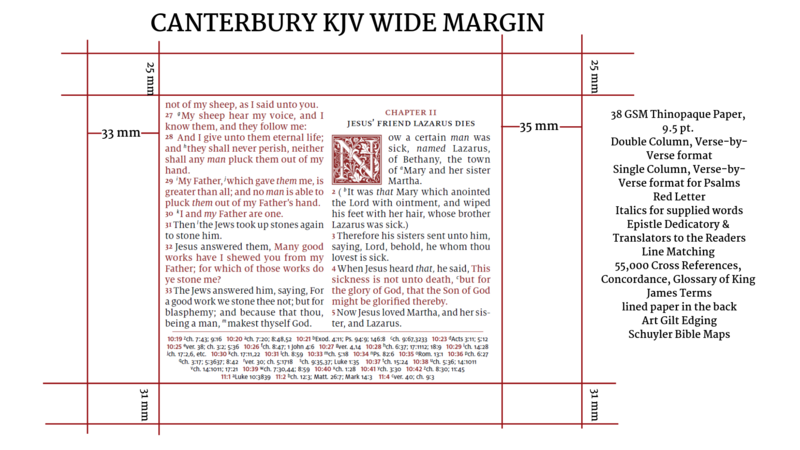 Schuyler Canterbury Wide Margin – Imagine the Canterbury KJV with a slightly reduced font size, red letter text, more opaque paper and ~1.4″ margins (inner & outer) 1.2″ on bottom, 1″ on top. Due TBA. 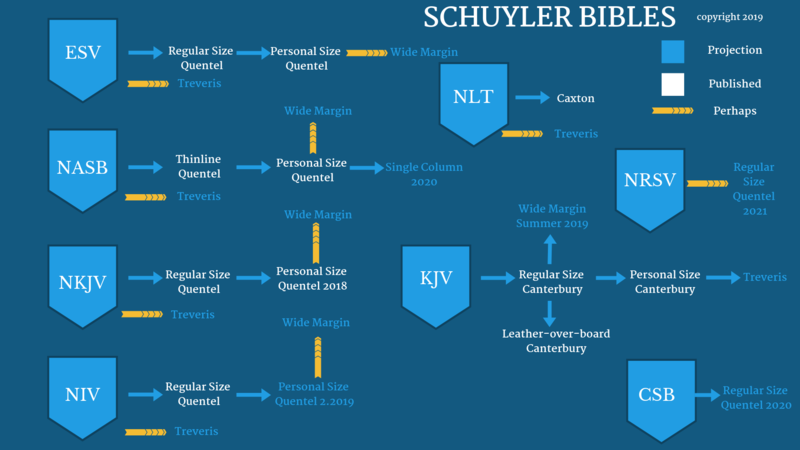 Schuyler Quentel NIV Personal Size – now in stock! – new stock arrives in late March – along with new colors of the Canterbury KJV. We expect to have a new array of ESV Quentel Regular Size Bibles in April. – pictures will be coming soon. Schuyler Treveris Series. This is a completely new typesetting of the Bible which will begin with the KJV. Publication is set for the fall. You may also want to use our search tool to find the Bible that best suits your needs. As we have said before, the premium Bible market is dominated by several players: Schuyler, Cambridge, Allan, and Crossway. As you will see below, Zondervan and Nelson have also put their feet in this market. Schuyler’s most popular format is its flagship Quentel Series. It is consistently a best seller at evangelicalbible.com. 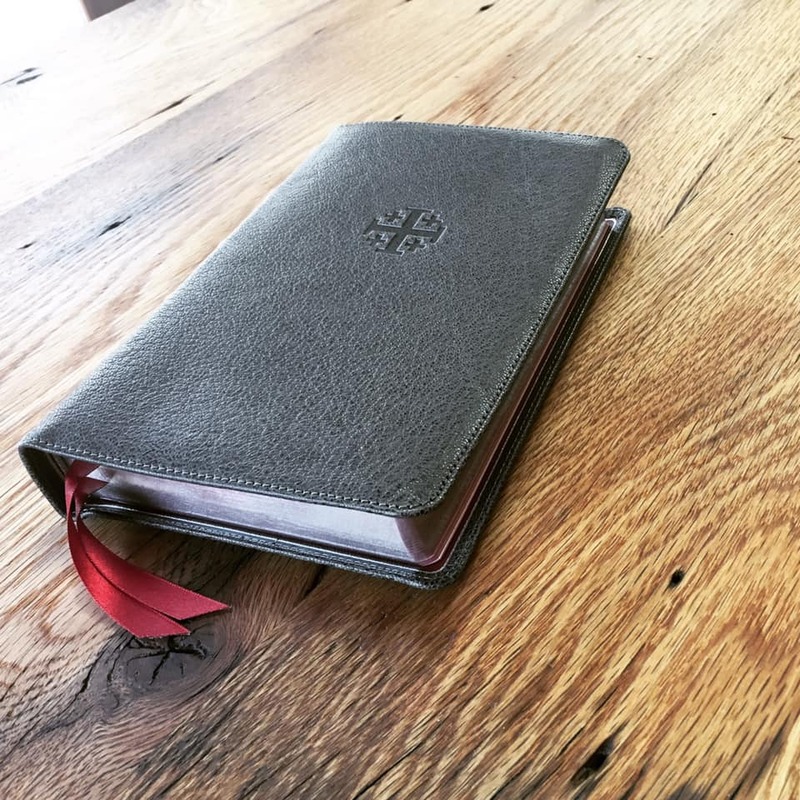 Published in the ESV, NASB, NKJV, & NIV, the Quentel is available in regular and Personal Size editions The KJV edition is called the Canterbury and is also available in a Personal Size edition. The Schuyler Caxton edition is an incredible NLT Bible with an amazing array of color choices. Here is a chart of all Schuyler Bibles. Cambridge recently republished their popular Turquoise (not to be confused with a color) KJV Bible which has received excellent reviews. It stands in the same class as the Allan Longprimer and Schuyler Canterbury. Cambridge’s Concord Reference KJV is a firm favorite along with their Clarion Series – available in the ESV, NASB, KJV, NKJV, & NIV. The British company, R.L. Allan, continues to publish its distinctive “Highland Goatskin” Bibles from relatively small binderies in the UK. Unfortunately, production supply has not kept up with demand, and therefore many Allan Bibles are out of stock before they reach the shores of the New World. We currently have the Allan Calfskin Longprimer and Longprimer Sovereign in stock as well as other editions. Zondervan/Nelson have created their own ‘Comfort Print’ premium Bibles. These are available in the NIV and NKJV in a single column and double column format as well as a classic KJV double column versified format.